Police were called to a Restaurant and Guest House on Dongtan Beach, 100 meters from the Dongtan Police Station on Jomtien Beach, on Monday Night, to assist a Norwegian who was threatening to throw himself onto a transformer. Pattaya Tourist Police Foreign Assistants were called in to negotiate with the Norwegian, Mr. Per StÅle Lund aged 37, who was standing on a 2nd floor flat roof at the location and was threatening to jump onto a transformer. According to Khun Aton aged 33, the restaurant manager, Mr. Lund had earlier dined with his girlfriend and her friend. A heated argument took place and the two women left, leaving Mr. Lund alone. He ordered a steak and when the meal came he decided to self-harm with the sharp steak knife instead of eating the steak. Mr. Lund then ran up to the 2nd floor where he remained for 3 hours as Police negotiated with him to come off the roof. The girlfriend and her friend returned back to the restaurant and told Police that the argument was over an ex-girlfriend of Mr. Lund who had returned to Pattaya to work. The current girlfriend assumed that Mr. Lund would return to her and an argument occurred because of this. After 3 hours Mr. Lund decided to jump off the roof but sustained minor injuries as preparations had already been made below the roof if he decided to jump. Police revealed to us that on 4th May Mr. Lund had been involved in a drunken altercation (drunken, really?) 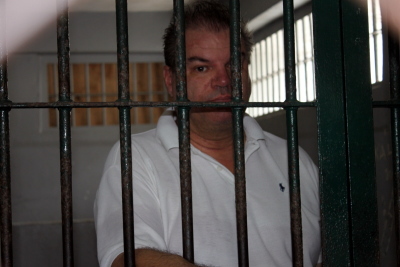 at a Beer Bar in Jomtien and had been locked-up for a time so he could sober-up. He was released on Monday afternoon. Mr. Lund was taken to Hospital as a precaution and Police will follow-up the case in due course. ‘Sooner, or later’, ALL the Crazy People in the World’ will come to Pattaya/Jomtien. At 4.30 am received reports of a young Norwegian citizen being robbed opposite the Pattaya Bay Walk Moo 9, Tambon Nong Prue, Banglamung, Chonburi. Police are now investigating for further details. 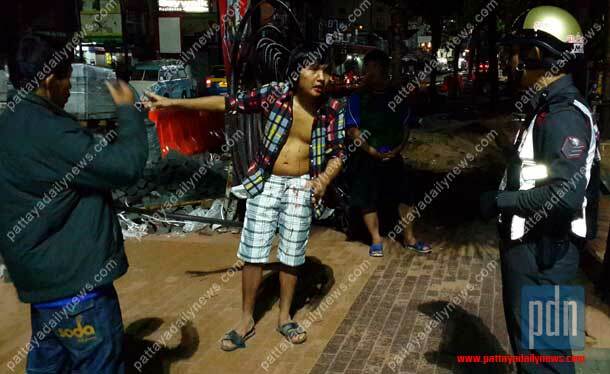 At the scene of the incident, Mr. Aung Pyi ‘Sven’ Nyein, aged 23 a Norwegian citizen was found in a drunk condition, his nose and mouth was bleeding, bloodstain on his clothes, and his belongings from his pockets were stolen and completely torn. Two slippers and a bottle of beer were also found at the scene of the accident it is believed to be of the criminals. The victim claims that before the incident happened he was sitting and chilling at the beach area and suddenly two guys walked towards him while they were hardly anyone at that area. At that time he noticed them but did not think they were criminals. The two criminals started robbing him and took his belongings from his pockets. He tried to save himself and call for help but the criminals pushed him down on the floor and started hurting him, by punching and boxing him. 6000 baht ($188 USD), a credit card, a mobile phone and few important documents were in his pocket was taken by the criminals. After robbing the 2 criminals quickly ran toward Walking Street leaving their slippers behind. After the police received reports that are now looking at searching for the criminal, they believe that it is either a drug addict gang or the criminal gang that usually steal in this area. Violent acts like this have reduced safety measures for a tourist city like Pattaya (I’m not sure exactly what that means – but really?). At 4:30 am, IF you want to be robbed by two men, get drunk, and then ‘chill, at the Pattaya Beach. GUARANTEED! A man with a fake Norwegian passport was arrested on charges of renting motorbikes from Pattaya shops and never returning them. Police assumed the man had sold the rental bikes for cash. He was confirmed as the thief by motorbike rental owners (see photo) who never got their motorbikes back. a report of a foreigner who had been found stealing rental motorbikes was received by Pol. Sub. Lt. Jakkrit Jandakham, investigation officer, Pattaya police station, Chonburi province. He rushed to the scene with a police team. Waiting for the police was the owner of motorbike-for-rent shop in central east Pattaya, who had finally caught a tourist who had been renting motorbikes from different shops but had never returned them. The officers restrained the suspect and examined his passport. The man’s passport identified him as Mr. Alex Hoge, age 40, nationality Norwegian, but officers found that it was a fake passport. When questioned by police, the suspect denied that he had sold the motorbikes after he had rented them. But police suspected that the man had been selling the rented motorbikes to individuals or in the open markets. Police detectives investigated further, and talked to other owners of motorbike-for-rent shops victimized by the foreigner. The group of owners told police that the man always chose the Honda PCX motorbikes to rent, which are very popular models nowadays. But when the rental contracts expired, the man did not return the motorbikes. The owners assumed the foreign thief who had rented the Honda PCX motorbikes was the same person, because he had the same appearance, and he also used the same telephone number as the suspect who was arrested. After the foreigner’s arrest, phone calls were made to other owners of motorbike-for-rent shops, to come and identify the suspect. They all confirmed that the suspect was the man who had rented their motorbikes and never returned them. Good Gawd Almighty, I Love this Town! The Norwegian man arrested last night after the gruesome remains of a human body were found in his Phuket home has confessed to “accidentally killing” Rungnapa Suktong, his girlfriend of nine years. Stein Havard Dokset, a 50-year-old retired car dealer from Oslo, Norway confessed to officers at Chalong Police Station today. “I did it, but it was an accident,” he said. “We had an argument. She pushed me and then I pushed her, and she fell down the stairs. I checked her pulse and she was not breathing… I didn’t know what to do. I was scared, so I hid her body,” (in a trash bin locked in a downstairs bathroom) he told police. Mr Dokset was arrested at his house off Soi Koktanode in Kata last night when officers from Crime Suppression Division, Sub Division 5, in Bangkok, arrived in force along with Chalong Police and Phuket Provincial Police. About 20 officers were involved in the raid, the Phuket Gazette was told. The raid was coordinated after a tip-off from a Bangkok law firm who were working on a missing person report filed by Mrs Rungnapa’s family in Surat Thani TWO YEARS ago.